The first Pictish throne to be built for a millennium has been unveiled by researchers investigating the lives of Scotland's most mysterious tribal people. The team spent a year crafting the oak of five Scottish trees into a design modelled on ancient carvings in a project that cost around £10,000. Raised thrones were important symbols of Pictish power for church leaders and kings, but none survive. The project at the National Museums of Scotland is part of a three-year research programme, sponsored by the Glenmorangie whisky company, and aims to improve understanding of Scottish history from 300AD to 900AD. This period of Scotland's early history between has many myths associated with it and is widely accepted to warrant more research. The Pictish throne is the first to be built in over a thousand years and was created by master furniture maker Adrian McCurdy whose design was inspired by depictions on some of the first Pictish sculptured stones to feature important people seated on thrones. Adrian, a veteran furniture maker who lives in the Borders, also worked on the recreation of Shakespeare's Globe Theatre in London. Beginning with a prototype in MDF, Adrian drew heavily on the Fowlis Wester stone from Perthshire, discovered early last century, built into a church that protected it from weathering, it shows a clear, detailed side-view, including the distinctive Pictish "key" pattern.and four or five other stone carvings for the work. "It was decided it would be made of oak, as it has been used for so many centuries as a durable wood, and is easily sourced," he said. After the team concluded the curved arm pieces must have been made from naturally curved wood, Adrian found some large branches felled in a storm, that were thought to be about 300 years old. He used traditional tools, including wedges, mallets, and adzes, to split and shape the wood. "It was decided we should follow the same tradition and method," said Adrian. "It was a matter of finding that shape on a tree." Eight or nine Pictish stone carvings show thrones but perhaps the best example is the Fowlis Wester. "It shows two of these thrones, essentially they are a pair," said researcher Alice Blackwell. "They had a number of distinctive features; the single curved arm and footpiece, and a very high seat – the figures shown are perching almost – and it had these curved terminals (endpieces]. We had to reconstruct that side view." Some of the features unique to Scotland were the foot block to stop people sliding off the high seat, otherwise you would have ended up with "your knees round your ears," she said. The curve of the seat would have forced a bishop or chieftain to sit forward and up. One possible piece of a Pictish throne, a curved terminal, or end-piece, of gilded wood, does survive in Ireland. There are stone thrones of the era from England and others on the continent, but none from Scotland. 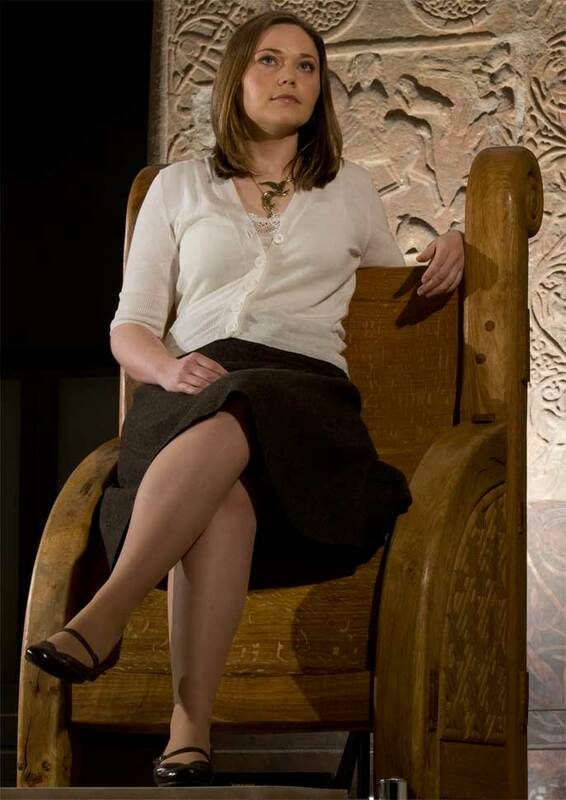 David Clarke, Keeper of Archaeology at National Museums Scotland, said: “Thrones were symbols of authority and power and as such would have been a very important part of Early Historic Scottish society that has hitherto been rather overlooked. “We are delighted to be able to work with National Museums Scotland to enable them to make exciting revelations about this period,” commented Paul Neep, The Glenmorangie Company’s Chief Executive. He continued: “At The Glenmorangie Company we are proud of our Scottish roots, particularly the ancient art and culture of the Picts which surrounds our Distillery in Ross-shire. 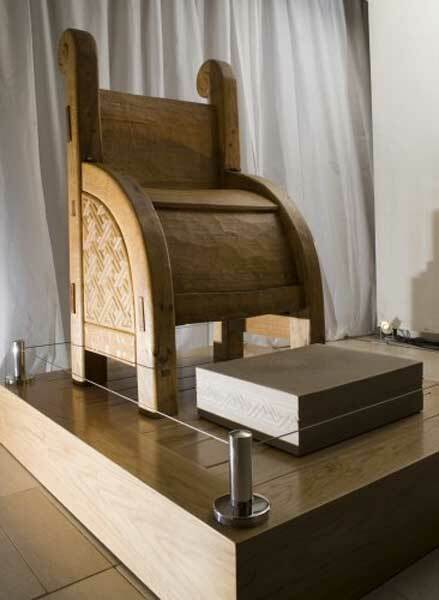 The throne will go on display first at the Edinburgh Festival Theatre, Nicolson Street, Edinburgh from 1 December 2009 and then at the Glenmorangie Distillery in Tain, Ross-shire in 2010 from where it will subsequently go on display at various destinations across Scotland.